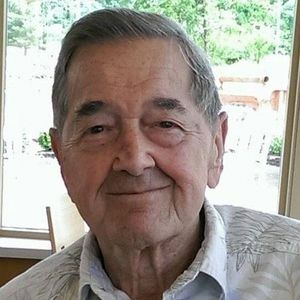 Edward M. Donner, 91 of Avon formerly of Avon Lake passed away peacefully on Sunday, February 24, 2019. He was born to parents Edmond and Helen (nee Balacek) Donner on January 17, 1928 in Cleveland, OH. Edward served in the U.S. Army Corp at the end of WWII. Edward married the love of his life and soulmate Rita (nee Lorenz) on September 11, 1948. They spent 48 wonderful years together till her passing in 1997. He worked as a tool designer and tool engineer for Ridge Tool Company Inc. for 28 years retiring in 1992. Edward was a member of Christ Evangelical Lutheran Church. He loved his family and spending time with them. He attended his grandchildren's school events and activities. Edward enjoyed bowling, fishing, woodworking and traveling with his late wife Rita whenever possible. He is survived by his loving children Ilona Rhodes, Edward J. Donner and Laura (Warren) Rasch; dear grandchildren George (India) Meesig, Chandra Meesig, Melissa Rhodes, Genevieve (Justin) Kowalczyk, Mariah Donner, Michael Donner, Cassandra Tenorio and Camille Rasch; great-grandchildren Jonah Meesig, River Meesig and Ian Meesig. He is preceded in death by his loving wife Rita (nee Lorenz) of 48 years and his sister Virginia Holliday. In lieu of flowers, memorial contributions may be forwarded to Christ Evangelical Lutheran Church 32747 Lake Rd., Avon Lake, OH 44012. Add your thoughts, prayers or a condolence to Edward 's guestbook.